Inspired by the classically simple lines of a mission style and overhauled with a modern rustic feel, our Vineyard Nightstands are sure to bring the warmth and comfort you're looking for to any bedroom in your home. Crafted by hand, these built to order nightstands feature three full extension drawers that coast smoothly on side mounted slides, offering you a lifetime of functionality while housing all of your bedside needs. Add the optional undermounted drawer slides for a clean look that incorporates a soft-close mechanism to ensure your drawers will never slam and wake your partner again. Below the flush-mounted, dovetail drawers lies a beautifully arranged set of ebony wood inlays, providing just the right contrast, exaggerating the natural grain patterns in the hardwood. The raised panel sides are reminiscent of a classic mission piece, but with the curved sides and base, the Vineyard Collection has a warm, rustic feel that will be perfect in an array of different decors. 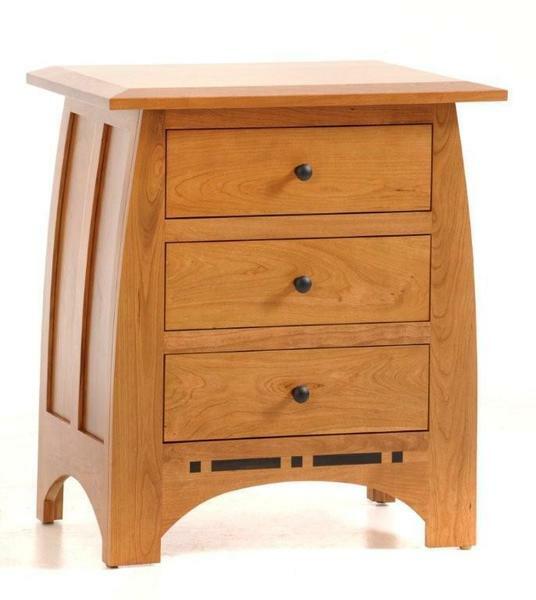 Available with three drawers, one drawer and a cabinet or one draw and a two door cabinet. There are plenty of different styles to choose from to ensure you get the best pieces to match your needs and decor. Choose the hardwood and finish options, don't forget the cedar drawer liners and let us craft the perfect nightstands for your space!